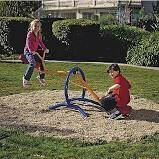 The Gym Dandy Teeter Totter features unique pendulum rocking motion and elongated soft cushion seats for added comfort. Constructed of metal and rubber for a durable piece that will last for years to come. If you have any questions about this product by Gym Dandy Teeter Totter, contact us by completing and submitting the form below. If you are looking for a specif part number, please include it with your message.